Do you want to see some live music this weekend? Of course you do. 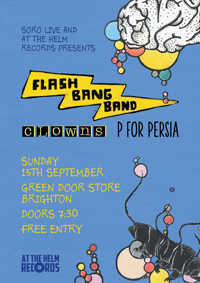 So here’s our picks of the best local bands playing around Brighton over the next few days. Thursday night is all about the support slots – Soccer 96 are at the Blind Tiger supporting Polaroid 85, and The Impellers are opening for Shuggie Otis’ rescheduled show at the Concorde. Friday Night is the launch of Le Juki’s new album Capillaries which is taking place at the Unitarian Church. Finally Saturday afternoon is Patchfest, which takes place at William Clarke Park, better known as The Patch – one of Brighton’s hidden gems tucked away behind Elm Grove and Lewes Road. 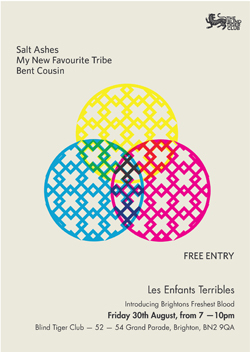 We don’t know much about the rest of the line up, but we do know that Bentcousin are playing at 3pm, which is good enough for us to recommend it. With any luck, Bent Cousin will be playing live soon to make up for the fact that they had to cancel their single launch. As soon as we find out more, we’ll let you know.